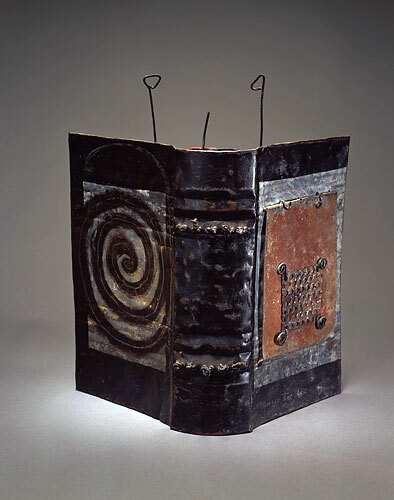 Artists' books are visual, tactile and spatial, and their physical qualities are integral to their meaning. Artworks exploring the book form are concerned with language and the cultural importance of writing. African artistic interest in this form is set against the complex backdrop of European imperialism and missionary work--forces that used writing to record, tax and control the lives of local populations. "The Book" is also recognized as a sacred and solemn expression of faith, associated in Africa with both Christianity and Islam. 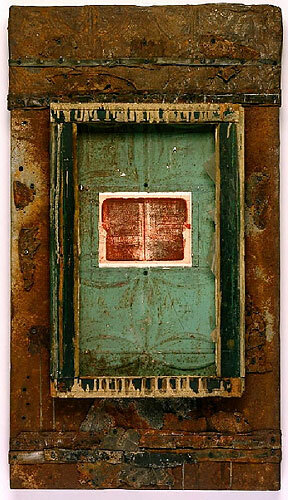 There are a wide array of artistic responses to and investigations of the influence and aesthetics of books. Some African artists question the very form of the book, moving away from the traditional volume to more animated, multidimensional approaches. Others deliberately fragment pages and excerpts of larger works, separating them for scrutiny and freeing them from convention. Entire tomes may be filled with inventive scripts imbued with personal meaning. In the hands of talented artists, such works illustrate the fragility of narratives, the dismantling of authority and the creativity of human endeavors. 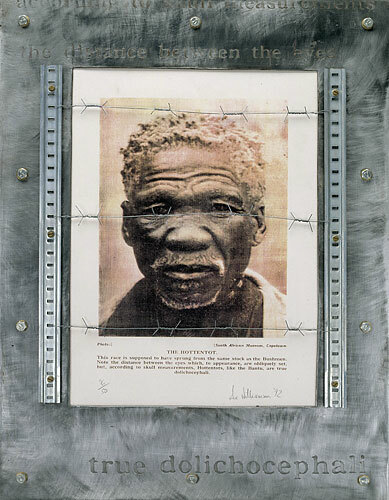 His father's passbook, the official identification document that black South Africans had to carry during apartheid, inspired Rudzani Nemasetoni to create the Apartheid Scrolls series. By requiring passbooks, the government restricted the movement of blacks within the country, particularly in urban areas where they were allowed to work but not reside. Nemasetoni recognized the irony of the passbook, which had beautifully decorated pages but was used for the ugliest of purposes. For Urban Testaments, Nemasetoni utilized found objects and materials that reminded him of his life in Soweto but actually came from demolished buildings in Harlem (New York City). The artist incorporated pages and elements from his father's passbook into each panel. Senegalese artist Abdoulaye Ndoye creates elegant, meticulously designed pages and, more recently, entire books filled with invented script. In his Parchment (or Parchemin) series (one work is displayed here), the artist uses ink on henna-treated pages to produce faded manuscripts that resemble the remnants of a bound volume now in slight disrepair. More astonishing are his script-filled books. 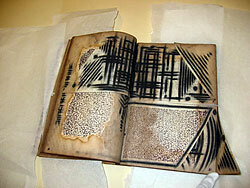 In this example, many of the pages are cut into sections so they can be flipped forward or back to match the text on the previous or next page. 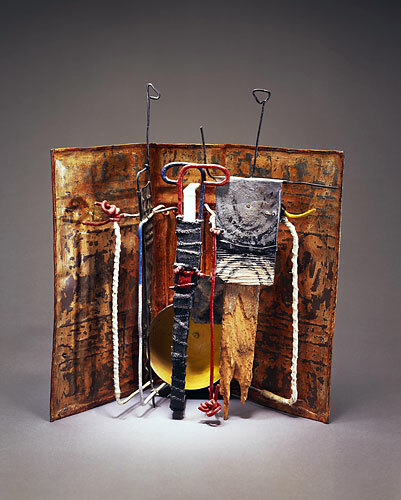 The work's title honors noted Malian intellectual Amadou Hampathé Ba, whose scholarship emphasizes African knowledge and its transmission through a rich array of cultural forms, including oral traditions and the arts. 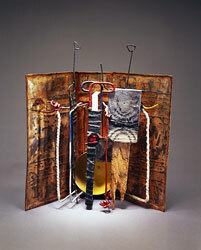 Ndoye's pages evoke the fragility of narrative and confirm the creativity of human endeavors. In addition, they celebrate the artist's superior skills over the mechanical reproductions of print technology. Sue Williamson investigates the political and ideological underpinnings of the written word in South Africa. In these two works (out of five in the series), the artist selected images and passages from an old government tourist brochure that described the traits of local populations to those searching for "exotic" and "authentic" Africa. Heavy metal frames inscribed with fragments of anthropometric observations hold ethnographic photographs and descriptions. The addition of metal chains or barbed wire literally traps the images for closer inspection. With these disturbing works, Williamson transcends mere commentary on prejudice in pseudo-scientific literature on South Africa. She questions the fate of these texts and images that are left over from an earlier period and are today open to new uses and interpretations.